Google has released a new app that conquers yet another behavior that previously required hands paying for stuff at the store. It’s called simply Hands Free, and now it’s time to start it and make it part of our daily lives. The Internet giant has recently announced that it is conducting experiments and field work with innovative system, which would use digital or digital wallets without even removing the card or cash. Only, all you have to do to pay the revolutionary Hands Free will just tell the cashier that payment will be made with Google. “Hands Free” as its name suggests, the main objective is to allow people to make purchases without having to take a phone or a wallet or purse. To use, customers should have a profile (recent photo) through a free application, which is available for both iOS and Android. The customer will only have to say that Google will pay to the cashier of a trade that obviously supports “Hands Free”, as published in its corporate blog. 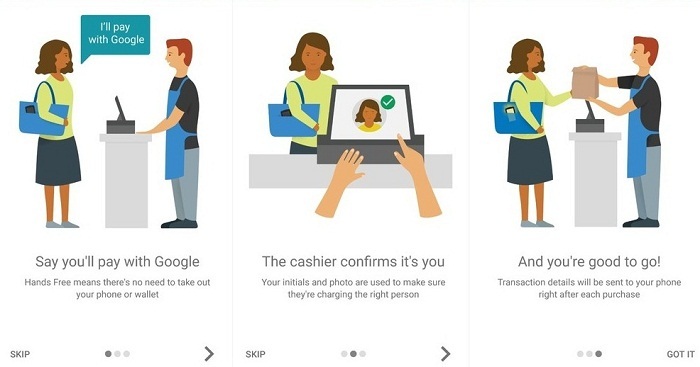 When ready to purchase, customers can say “I pay with Google,” and the cashier confirm the payment using only the initials of the person and the photo associated with the free application. This new hands-free system to pay with mobile has been available on smart phones with iOS and Android operating systems on a small number of restaurants in the area of ​​Silicon Valley, among which is included McDonald’s. Google uses a visual identification through a camera in the store to confirm the identity based on the profile image of “Hands Free”. Just like that as with Android Pay, “Hands Free” does not transmit the card details to merchants. Google has ensured that payments are fully trusted, and that shops will never know the data of credit card customers. The company insisted that customers will receive instant notification at the time when payment is made, and that automatically analyze user activity to detect and prevent suspicious movements. Next Story → iPhone SE why go for a more compact model?